The department staff is involved in theoretical and applied mathematical research related to engineering, environmental and medical applications. The field of research includes the theory of ordinary and partial differential equations, development of numerical methods for partial differential equations, applied probability and stochastic modelling. The department also cooperates with industrial partners when working on specific issues. The main research activities are focused on modelling of fluid flow or fluid-structure interaction. We have several in-house developed CFD codes. We test mathematical models and numerical schemes suitable for the modelling of turbulent flow of compressible and incompressible fluid. 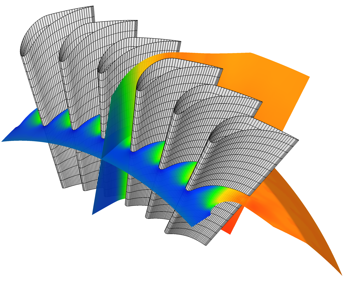 There is a long-term cooperation with Doosan Škoda Power on simulations of turbulent flow in turbomachinery. We participate in projects with TU Brno (flow in different types of channels), Faculty of Mathematics and Physics, Charles University, IT AS CR and University Toulon (flow in atmospheric boundary layers), MUS (transportation of pollutants), IT AS CR (turbulence modelling, aeroelasticity problems - flow in vocal cords), University Paris 13 (modelling of electrical discharge - cold plasma motion), TU Lisbon (simulation of flow in blood vessels). The staff members of our department participate in research teams of national and international grant projects as well as in direct contracts with industry. Our staff members regularly participate in international conferences and also publish articles in renowned international journals. Our department also organizes or co-organizes international conferences and workshops (Finite Volumes for Complex Applications 6, Topical Problems of Fluid Mechanics, Non-Homogeneous Flows and Fluid, Particles in Flows).